braze-welded plate-type heat exchanger, micro-channel full-aluminum air coils and thermostatic expansion valve. The range is composed by units equipped with four compressors in tandem configuration on two independent refrigeration circuits. The W3000TE controller offers advanced functions and algorithms. The Compact keypad features an easy-to-use interface and a complete LCD display that allows consulting and intervening on the unit by means of a multi-language menu (19 languages are available). The regulation is based on the patented “Quickmind” water temperature regulation logic uses self-adapting control to maintain flow temperatures and optimise performance even in low water content scenarios. As an alternative, the proportional or proportional-integral regulations are also available. The diagnostics comprises a complete alarm management system, with the “black-box” (via PC) and the alarm history display (via display or also PC) for enhanced analysis of the unit operation. Optional proprietary devices can perform the adjustment of the resources in systems made of several units. Consumption metering and performance measurement are possible as well. Supervision can be easily developed via proprietary devices or the integration in third party systems by means of the most common protocols as ModBus, Bacnet, Bacnet-over-IP, LonWorks. Compatibility with the remote keyboard (up to 8 units). consumption during periods of inactivity. Up to 10 daily time bands can be associated with different operating set points. The defrosting (air source reversible unit only) follows a proprietary self-adaptive logic, which features the monitoring of several operational parameters. This allows to reduce the number and duration of the defrost cycles, with a benefit for the overall energy efficiency. case of reduced clearances or when retrofitting existing installations. The full aluminium micro-channel condenser coils deliver high efficiency whilst ensuring a reduced refrigerant volume and a lower unit weight. The e-coating protection (optional) grants the highest level of resistance to corrosion in any condition, even in the most aggressive environments. Full load operation is ensured with outdoor air temperature up to 46°C, partial load operation is possible up to or even beyond 50°C. 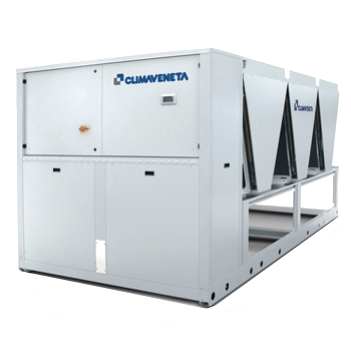 The unit can produce chilled water at negative temperature (down to -10°C of leaving water temperature). Dedicated accessories allow the unit operation down to -20°C of outdoor air temperature. Traditional coils with copper tubes and alluminium fins, also available with prepainted fins or Fin Guard Silver protective treatment.